This Saturday plays host to the Quintin Head of the River Race hosted by the Quintin Boat Club. The course runs from Chiswick Bridge to Hammersmith with a fast-flowing tide, providing challenging conditions that are recommended for only the experienced rower. Spectators can gather along the route to view up to 250 Open, Women and Mixed crews of eight racing 4600m, an equivalent to almost 3 miles! The Quintin Head of the River race is the beginning of a very busy 2014 race and regatta schedule. Events are taking place up and down the Thames from Henley to Gravesend, most of them gliding through the heart of London. With the rowing season rapidly approaching, lets take a look at the history of rowing along London’s River Thames. Rowing is one of the oldest sports in Britain, with its roots in the eighteenth century, however it did not originate as a sport. Until the beginning of the nineteenth century it appears to have been entirely professional as a means of transportation and warfare. The Thames is the setting for three of the most celebrated rowing events in the world. Doggett’s Coat and Badge Race is the oldest rowing contest in the world, held annually since 1715; The annual Oxford v. Cambridge Universities Boat Race that is watched by thousands along the banks of The Tideway and millions more on TV around the world; And outside London at Henley-Upon-Thames, the Henley Royal Regatta. 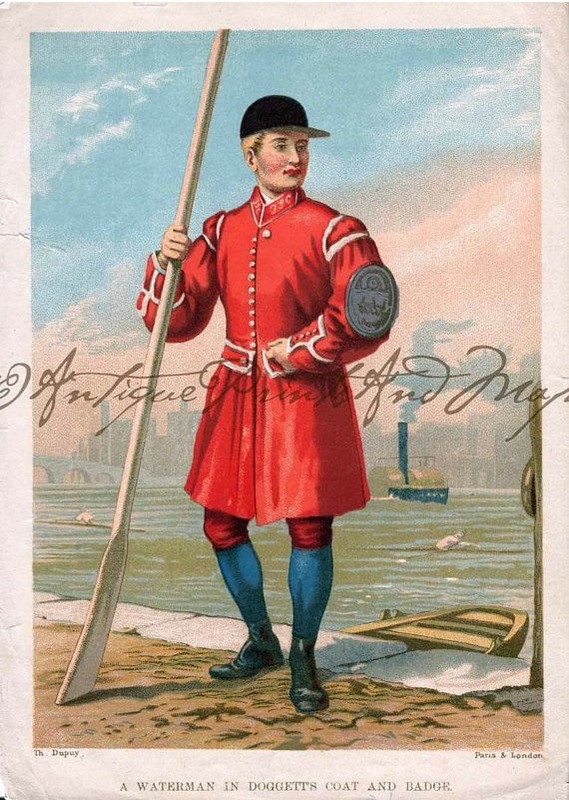 The oldest rowing fixture on the Thames instituted nearly four centuries ago is the annual race for Doggett’s Coat and Badge. Rowed on 1 August 1715, the first anniversary of George I, six young waterman raced to be awarded a waterman’s coat and silver badge by Thomas Doggett, an eminent actor of Drury Lane, who, at his death in 1722, bequeathed a sum of money to ensure the continuance of the tradition. The Oxford v. Cambridge boat race was started by Charles Merivale, a student at St John’s College, Cambridge, when he challenged his Old Etonian school friend Charles Wordsworth who was studying at Christ Church, Oxford to a boat race. Oxford easily won the first race in 1829 and has since been held annually since 1856, except during the First and Second World Wars. The course covers a 4.2-mile (6.8 km) stretch of the Thames in West London, from Putney to Mortlake passing Hammersmith and Barnes. It is sometimes referred to as the Championship Course, and follows an S shape, east to west. As of 2013 Cambridge have won 81 times and Oxford 77, with one dead heat. Now, the race is a well-established and popular fixture in the British sporting calendar. For the rowing enthusiasts, venture outside of London and to Henley to discover more about the sport. The River & Rowing Museum preserves rowing’s significant artefacts, building a library and archive about the activity, which started with the Egyptians and continues today with University Blues and Olympians. It is home to rowing’s Henley Royal Regatta’s heritage and the world-famous Leander Club, one of the oldest rowing clubs in the world. There are also interactive displays on the art of rowing and the search for speed enabling visitors to learn more about the sport. Exhibits include the boat used by Steve Redgrave and Matthew Pinsent who won Britain’s only Gold Medals in the 1996 Atlanta Olympic Games as well as the world’s oldest-known competitive rowing boat. Best of luck to rowers taking part in the Quintin Head of the River Race and we look forward to an exciting year ahead! 24 Jan	This entry was published on 24/01/2014 at 6:07 pm. It’s filed under River Thames, Uncategorized and tagged boat race, Cambridge, doggetts coat and badge, Oxford, quintin boat club, quintin head of the river race, rowing. Bookmark the permalink. Follow any comments here with the RSS feed for this post. Newer: Oxford vs Cambridge – Which Blue Are You?